10. XLR INPUT – Connect professional equipment using an XLR connector. 11. 6 mm (¼") INPUT - Connect equipment using a 6 mm (¼") balanced or unbalanced connector. professional equipment and sources with very high output. 13. LOW FREQUENCY TRIM – Allows boost or attenuation of low frequency output by 2 dB. 14. HIGH FREQUENCY TRIM – Allows boost or attenuation of high frequency output by 2 dB. 15. VOLUME CONTROL – Use this control to set the maximum listening level. 16. 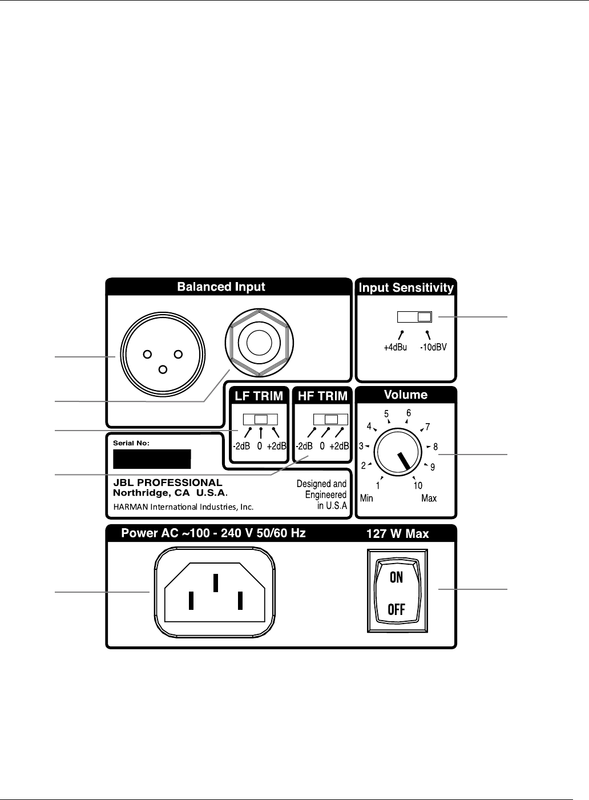 POWER RECEPTACLE – Connection for the power cord. 17. POWER SWITCH – Activates power for the system. source to the speaker using either the XLR INPUT CONNECTOR, OR the 6 mm (¼") TRS INPUT CONNECTOR. Do not connect multiple signal sources to both input connectors simultaneously.